Thousands of people who are blind or vision impaired throughout the country are getting ready to use the brand new tactile ballot template in the upcoming referendum, meaning they can now cast their votes in secret for the first time. Up to now people with sight loss had to rely on others to help them exercise their franchise, which compromised their privacy. A landmark High Court case taken by Dublin man Robbie Sinnott, who is vision impaired ,cleared the way for a tactile mechanism to be used to allow people who are blind or visually impaired exercise their franchise independently. 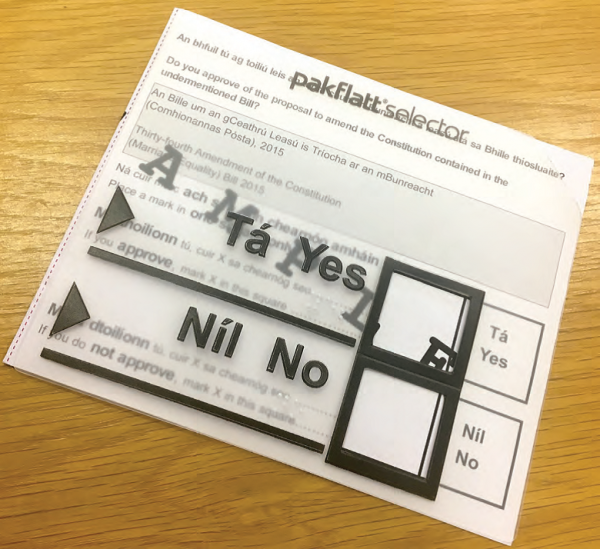 The Department of Housing, Planning and Local Government has produced a tactile ‘ballot paper template’, taking on board design recommendations from the National Council for the Blind of Ireland. The template is a clear plastic device which is placed over the ballot paper and features raised lettering, large print and braille. It also has cut out sections to assist people to find where to mark their vote. The templates will be available at every polling station around the country. Chris White CEO of the NCBI says “This is an historic year for people who are blind or vision impaired. Up to now their vote was not secret, they had to discuss their choice with somebody else and they could not even be sure that their preferred vote went into the ballot box . This situation was never acceptable to the NCBI and we are delighted that our recommendations have been taken on board by the Department. We are urging people with sight loss to contact the NCBI in advance of the upcoming referendum and try out the tactile templates to ensure they are comfortable and at ease using them. Our regional offices will be equipped with the templates and there will be ample time for people to have the opportunity to try them”. Robbie Sinnott says “Up to this people with vision impairments had the right to vote in theory but the practise caused huge problems . It was completely unacceptable that we had to ask people to come with us as we exercised our constitutional rights. I have looked forward to this day for so long”. Audrey Tormey, who is blind and works for the NCBI, says she is looking forward to being independent and autonomous when voting in referenda in future. “This is a monumental step forward for people who are blind or vision impaired . Prior to this I had to compromise my privacy when voting and it just wasn’t on. Just because I can’t see should not mean I can’t exercise my constitutional rights, discreetly and in secret. No more will I feel that my desire to vote is lesser than somebody else’s who just happens to be able to see!”.